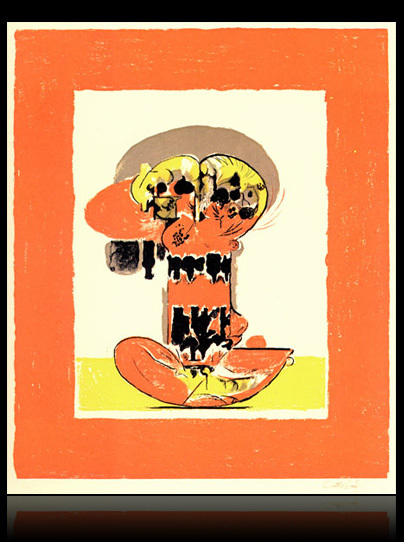 Lithograph, 1972, printed in four colours, 34 x 41 cm (13.4 by 16.1 in). Signed by hand and numbered 18/90. Published by XXe Siécle, Paris. Printed by Fernand Mourlot, Paris. Tassi/Quinn 130. He was one of the most famous British artists of the 20th century and received many honours. His works are represented international at main museums and galleries. The National Portrait Gallery in London gave him a retrospective in 1977 and the Tate Gallery a major retrospective in 1982. Literature: Vollmer, vol 4, p. 391-92; Knaurs Lexikon der Modernen Malerei, pp 326-27; Roberto Tassi, Edward Quinn, Graham Sutherland, Tout l'oeuvre Grave, Paris 1980. Further reading Douglas Cooper, The Work of Graham Sutherland (1961). Excellent condition. Further details and price on request.